BABCOCK RANCH, Fla. — I was standing in front of the ME Miami hotel in downtown Miami, just across the bay from Miami Beach, and was about to drive the new 2017 Chevrolet Bolt, an all-electric compact crossover, to Babcock Ranch on Florida's Gulf Coast. I must admit, I had never heard of the place. Odds are, neither have you. Nestled between Naples and Fort Myers, it's a sustainable 18,000-acre development set among the 73,000-acre Babcock Ranch Preserve. All of its power is solar generated on a 440-acre parcel owned and operated on the preserve by Florida Power & Light Co. The town's homes are built to Florida Green Building standards using sustainable local materials, and are accented with native plants. Builders even relocate trees on the property to preserve them, something uncommon just about everywhere else. It was a natural place to recharge the Bolt. And it's 164 miles from Miami. It'd be tough reaching Babcock Ranch with one of the other electric cars currently available: The Hyundai Ioniq Electric has a 124-mile range; the Volkswagen e-Golf rates at 83; the Ford Focus Electric can go 115; the BMW i3 can reach 114 or 81 depending on model; the Nissan Leaf gets 107; the Kia Soul Electric does 93; the Fiat 500e can travel 84; and the Mitsubishi i-MiEV is capable of 62. The Bolt, though, can traverse 238 miles on a single charge — so, no problem. Notice I didn't mention Tesla. The two models currently available, the Models S and X, are luxury vehicles costing two or three times more than a Bolt. And the Model 3, should you order one today, won't be available for another 12 to 18 months, according to Tesla's website — and we know how good the company has been at meeting its own deadlines and, for that matter, earning a profit. And while the Model 3's slinky silhouette is more fetching than the funky, functional Bolt, buyers are increasingly choosing crossovers over sedans, and once inside the Bolt, you can understand why. The driver faces an instrument panel that’s strikingly modern and dominated by a large 10.2-inch color touch screen that’s easy to reach and operate. Its size is deceptive, and its shape pays big dividends in convenience. With nearly 17 cubic feet of cargo space and 95 cubic feet of passenger space — one cubic foot less than a larger BMW 330i sedan — there's ample room for four full-size adults, including a rear seat that sits high enough to comfortably satisfy those older than 10 years old. The driver faces an instrument panel that's strikingly modern, dominated by a 10.2-inch color touch screen that's easy to reach and operate. It not only provides metrics on the car's performance, it also accommodates Apple Car Play and Android Auto. A backup camera is standard. Other niceties include wireless phone charging and a compartment large enough to stow a tablet. But it's the Bolt's performance that proves most pleasing. If you've never driven an electric car, the instant rush of torque upon acceleration will delight you. Once underway, the Bolt is no sports car, but proves responsive and fun to drive, thanks to quick steering and a diminutive size that makes it positively zippy. Credit the 288 lithium ion cells that make up the battery pack. Placed between the car's axles beneath the passenger compartment, and weighing 960 pounds, the battery dispenses 200 horsepower and 266 pound-feet of torque. Reaching 60 mph takes 6.9 seconds. And while you might think the speedometer is the most important gauge in a car, on the Bolt, it comes second to the power meter, which displays a minimum and maximum range as well as the actual range based on your driving habits and accessory usage. Traveling across Alligator Alley, I encountered heavy thunderstorms, which aggressively drained the car's range. I started to have a twinge of range anxiety, as there are few EV chargers located along most of the route, despite the fact that Florida was second only to California for plug-in EV sales last year. I decided to drive in L mode, which amps up the car's regenerative braking, a system that uses energy captured during braking to recharge the battery pack. Braking is so strong you rarely need the brake pedal. Nevertheless, my fears were unfounded. I arrived at Babcock Ranch with 55 miles of charge to spare, enough to get me almost a third of the way home again. Recharging, though, would take some time. Using a 240-volt outlet, the Bolt recharges in nine hours, although it's rare that you'll ever drain the battery. A DC Fast Charger can charge up to 90 miles of range in 30 minutes, although the plug you'll need for this doesn't come standard with the car. You can use a 110-volt outlet, but it only provides 4 miles of range per hour. While the car recharged, I did the same at the Table & Tap restaurant, following that with a night at the Brandywine model house in Babcock Farms. At 1,800 square feet, it seemed an ideal home, just like the Bolt seemed an ideal car. And for most of us, it is. 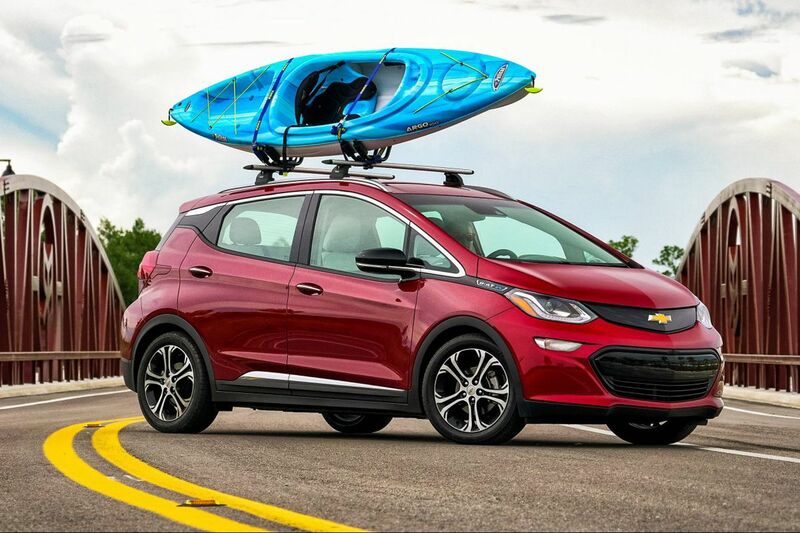 Spacious, environmentally friendly, and fun to drive, the 2017 Chevrolet Bolt is a mainstream electric car that's perfectly suited to the demands of everyday use. With 200 horsepower, 238 miles of range, and a price tag that starts at less that the average price of a new car — once you add the EV federal tax credit — it's a remarkable feat and a landmark car. No wonder it's the 2017 North American Car of the Year.